If you haven’t come across Chibebe baby bean bags yet, consider this your introduction. 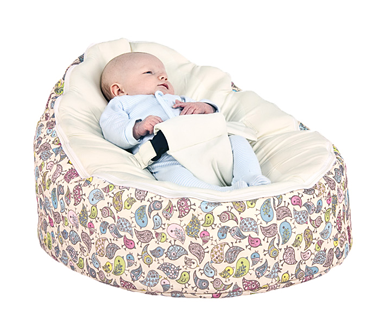 Chibebe Snuggle Pods Baby Bean Bags are an adorable and comfortable secure-seat that can be used from birth till teen-hood. The seat cradles Bubba on top of the detachable pod seat. This seat contains a layer of padding that reduces the noise of the Styrofoam beans when Bubba squirms and kicks. Held by a padded three-point harness, Bubba relaxes in a resting position but is tilted up so he can interact and see what is going on around him, rather than staring at the ceiling. This tilted position can also help prevent reflux and “Flat Head”, as Bubba’s head is not resting on a hard, flat surface. The Pods are safety tested to high standards, but don’t worry – that doesn’t mean they don’t look incredibly cute! There are three design collections: Serendipity, Urban and Retro, with between three and five designs in each collection. You choose your pattern and the colour of your seat, and if you wish you can purchase spare Pod seats or toddler seats (no harness). 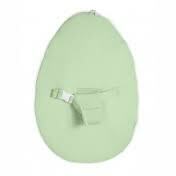 These come in Cream, Sunshine Yellow, Apricot, Blue, Grape Purple, Lime Green and Pink – so a Pod for a big brother can be turned into a Pod for a little sister. I have the ‘Chirpy’ pattern with the cream seat from the Urban Collection, but I absolutely love the ‘Hippy Daze’ from the Retro Collection. When Bubba outgrows the harness, you can unzip the baby seat and zip on a seat without a harness. This system also means you can easily wash the seat in the washing machine. The outer casing is also machine washable, but you don’t have to refill the beans each time you want to wash it as the pods come with a separate insert. The inserts are also sold separately for $9.95 in case you need to replace them – though the base and seats both have water-resistant backings, so those beans are protected by two layers. These Pods are also wonderfully light, so when your Bubba becomes a toddler they will be able to move their Pod around without your help. Also available for purchase is a Pod Rocker Accessory for $59.95. 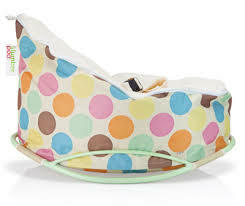 The Pod Rocker allows you to rock your Bubba while in the Snuggle Pod. You just pop the Pod on the Rocker before you put Bubba in the Pod. You can find more information and purchase your own Chibebe Snuggle Pod Baby Bean Bag or additional seats for $24.96 from the Chibebe website. The Pod does cost $109, which may not be in every new parent’s budget, but they are worth making room for. What is your favourite Chibebe Snuggle Pod design? What other seats have you used to put your Bubba in? Have your children enjoyed their own bean bags before? Don’t forget to Like Bubbaverse on Facebook. Enter your email address to follow Bubbaverse and receive email notifications of new posts.